Today's recipe is for beef empanadas! These tasty pastries can be stuffed with any protein of your choice. Today's recipe is beef empanadas! These tasty pastries can be stuffed with any protein of your choice. We love recipes that deliver a lot flavor without a lot of calories, and this recipe does just that. It gets bold and tasty flavors from garlic, ground cumin, dried oregano, cayenne pepper, chili powder, and more. Empanadas are a great appetizer or main dish. Our recipe is only 284 calories per serving and has 3 grams each of iron and fiber. 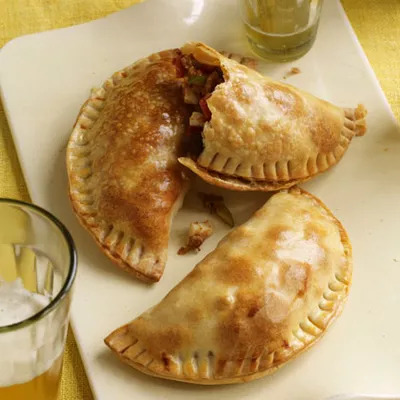 Ingredients: olive oil, onion, garlic cloves, lean ground sirloin, ground cumin, dried oregano, salt, chili powder, freshly ground black pepper, cayenne pepper, tomato paste, diced tomatoes, raisins, pitted green olives, hard-cooked large eggs, frozen empanada pasta discs.